The Bridge House is perhaps the most varied-use structure in Poly Canyon. Begun in 1965 and completed by 1968, this structure was one of the first nation-wide to utilize Cor-ten steel. This allowed the students to expose the steel and recreate the designs of Craig Ellwood, a prominent architect of the time. Architectural and Architectural Engineering students originally designed this to be used as lodging for visiting guest lecturers and critics. Over the years, it has been adapted into an architecture studio and canyon caretaker’s home. Today it functions as a seismic testing facility for Architectural Engineering students. 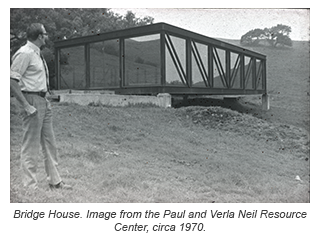 The Poly Canyon Bridge House was completed in 1968 by students Ronald Davena, Joel Dean, Robert Garlow, Raymond Hilken, Lui Horstmeyer, James January, Lloyd Suehiro, and Thomas Wiggin under the guidance of faculty members Kurt Holder, Bruce Campbell, and Tom Matles. The project fell in line with many objectives the students wanted to achieve, including testing the newly discovered Cor-ten steel, designing a structure to span over the arroyo, and creating a housing facility for important campus guests. The original senior project proposal intended for the Bridge House to be used as short-term housing for guest lecturers and critics visiting the campus. Over the years, the building has been used as a canyon caretaker’s home and an architecture studio (need to find source to confirm). Today it serves the Architectural Engineering department as a seismic testing facility. Each exterior brace is removable to reconfigure the system to resist seismic loads. Small vibrations are sent throughout the structure while the deflections are closely monitored. After damage to the glass walls, the structure was enclosed with plywood panels. In 2015, the Canyon Days Committee began a handrail project to open the structure once again. This is expected to be completed by summer 2017. The Bridge House was modeled after the designs of Craig Ellwood, a prominent Los Angeles-based architect from the 1950s through the mid-1970s. In his early career, he began to explore the idea of creating a building that functioned like a bridge, spanning over rivers and uneven landscapes. This would enable sites commonly thought of as unusable to be developed. The Cal Poly students modelled the Bridge House in Poly Canyon after projects created by Craig Ellwood Associates, such as the Chamorro House (Steel Bridge House), commissioned in 1962 (unbuilt), and the Frank and Polly Pierson House #2, commissioned in 1963. In 1976, Craig Ellwood Associates completed the Art Center College of Design in Pasadena, CA, which closely mimics the geometry of the Poly Canyon Bridge House, spanning nearly 4 times as long over the arroyo. This structure marks the first use of Kaisaloy 50 CR steel from Kaiser Steel Company on a large scale. Because very little was known about the material durability in structural purposes, all of the weathering steel was donated to the students, allowing the company to test the product while providing students the senior project opportunity. Kaisaloy 50 CR is a form of weathering steel, also known by the name Cor-ten steel. The steel is chemically composed with additional metals such as carbon, silicon, copper, and nickel, among others. Weathering steel is designed intentionally to rust when exposed to weather to create a protective layer that resists any material degradation that could lead to a loss in strength. Another way to think about it is like a vaccine; a small, deliberate dosage prevents a larger and more dangerous effect later on. The students who designed the Bridge House received an Award of Excellence from the American Institute of Steel Construction.